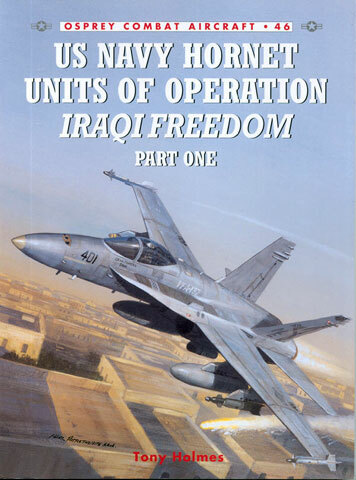 Osprey Publications Aerospace editor and Naval Aviation aficionado Tony Holmes is just publishing the first in a series of books covering US Navy Hornet operations during Operation Iraqi Freedom. Combat Aircraft Series Number 46 is focused on the use of the F/A-18 Hornet and Super Hornet by Carrier Air Wings operating in the Northern Arabian Gulf (NAG) during the period leading up and during the Iraq War. It is the first of three volumes covering US Navy, Marine and RAAF use of the Hornet in Iraqi Freedom, with the second volume to cover Mediterranean based carriers and the third land based use by the USMC and RAAF. Tony Holmes is a noted aviation writer and photojournalist and has a long track record publishing for Osprey including launching and editing the Aircraft of the Aces series. He obvious knowledge of the subject and list of credits citing many veterans of the conflict ensured a detailed and accurate account of the operation from the perspective of the Hornet Community. I have been greatly looking forward to this book for some time and was not disappointed when it arrived in the mail for review. So what do you get in the 96 pages of this volume. The author has sensibly broken down the subject area in order to cover as much territory as possible. This is essential, as the Hornet was the strike aircraft of choice in OIF, with some 250 being deployed vice the 130 odd F-16s and 90 F-15C/Es from the USAF. The book sets the scene with a quick review of Operation Southern Watch and the road to war, highlighting the metamorphosis into Southern Focus as the US prepared the battlefield of southern Iraq in late 2002 and early 2003. Subject areas touched upon include the increased use of JDAM as a weapon of choice for Response Options and the retasking of the USS Lincoln to return to the NAG over the summer of 2002/3 which was so prominently covered on Australian television as it sat off the coast of Western Australia being replenished for war. The second chapter of the book is titled “Shock and Awe” and covers strike ops conducted by Hornets in the first days of OIF. Many first person accounts are included and to my mind make the book. It was one thing to plan the campaign and assess the results as mission reporting and tapes were returned, it is another to get inside the minds of the guys who did the real dirty work. It is hard to imagine how concentrated the mind is when flying into one of the densest air defence environments in the world around Baghdad, but the frank descriptions from both strike leads and ordinary line pilots goes a long way to understanding the human aspect of air warfare. Through this section the reader also gets an idea of the complex process required to coordinate modern air campaigns, from the Combined Air Operations Centre (CAOC) at Prince Sultan Air Base, down to the air wings aboard ship. Explanations are easily followed and venture into some of the defining aspects of the OIF air war, including the prosecution of time critical targets. The real meat of Hornet operations in OIF was providing close air support (CAS) to the advancing Marines and US Army V Corps units. Chapter 3 “Shaping the Battlefield” deals with this aspect of the war, providing an outline of how tasking came from the troops in the field, via ground or airborne Forward Air Controllers to the waiting tactical jets. Again first person accounts are used extensively to illustrate the points made. However clear and concise text leaves the reader with no doubt as to what is being discussed by the aircrew, with explanations of Kill Boxes and FAC processes provided to put a pilots story into context. This chapter also extensively deals with the second major blue on blue of the air war, when Lt Nathan White was shot down and killed by a Patriot SAM near Karbala. The author has been careful not to sensationalise this aspect of OIF, but does put the incident into context, covering some of the theories as why the shoot-down occurred and outlining the steps taken to prevent it reoccuring. The final chapter “Super Hornets in OIF” closes out the book with a look at the US Navy’s newest aircraft and it’s combat record. Whilst addressing the importance of the “five wet” tactical tanker ops undertaken by some Super Hornets, the author goes some way to addressing the mistaken perception that this was the major contribution of the type to OIF. This book has strong appeal to all those who have an interest in the most recent Middle-East War and a desire to learn about the state of the art of modern US Naval air power. A single appendix provides details of all NAG based Hornet units by carrier and air wing. 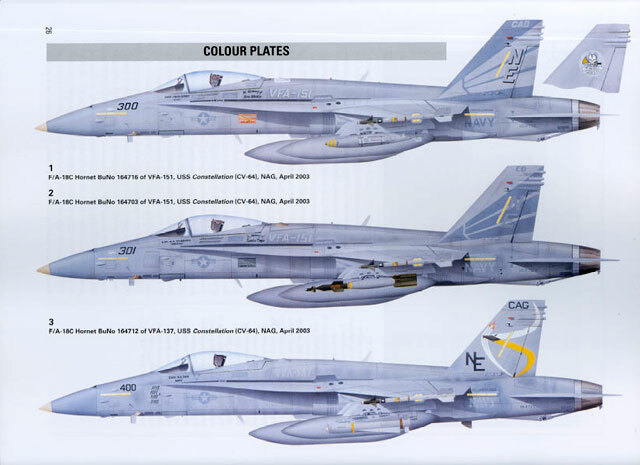 No scale drawings of the F-18 are included but these may come in later volumes. As usual for Osprey Publications, 21 colour profiles fill the centre pages with some of the more interesting colour schemes carried by the Hornet documented. This edition also had a very high number of full colour and black and white photographs scattered throughout, illustrating the authors points, but also of a size and clarity useful for modelling reference. Having read this volume I cannot wait for Ospreys subsequent volumes on the subject of Marine and RAAF Hornets and US Navy F-14 operations which are due out this year. The book consists of 96 pages printed on glossy paper between cardboard covers.